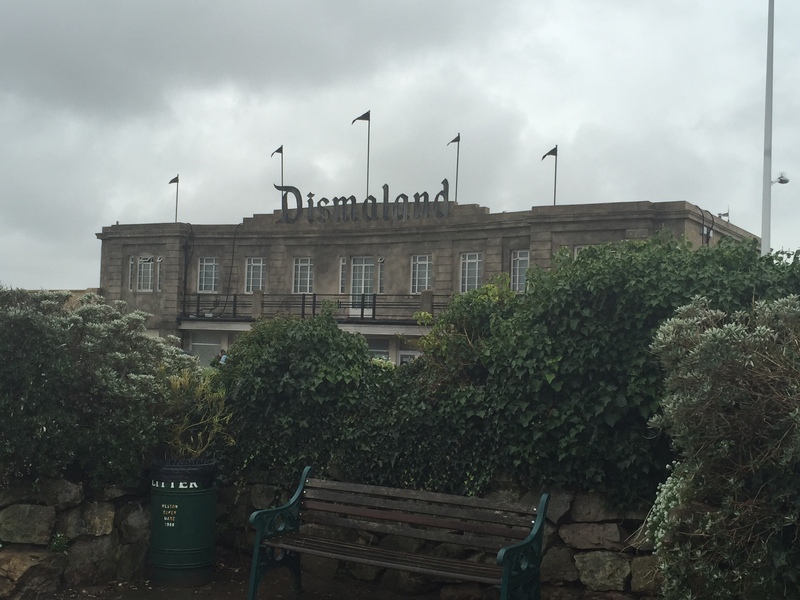 Yesterday I visited the UK’s most disappointing theme park – Dismaland in Weston-super-Mare. This is a little different to your average family day out, urban street artist Banksy identifies creating it as an attempt to send an appropriate message to the next generation: “Sorry kids. Sorry about the lack of meaningful jobs, global injustice and Channel 5. 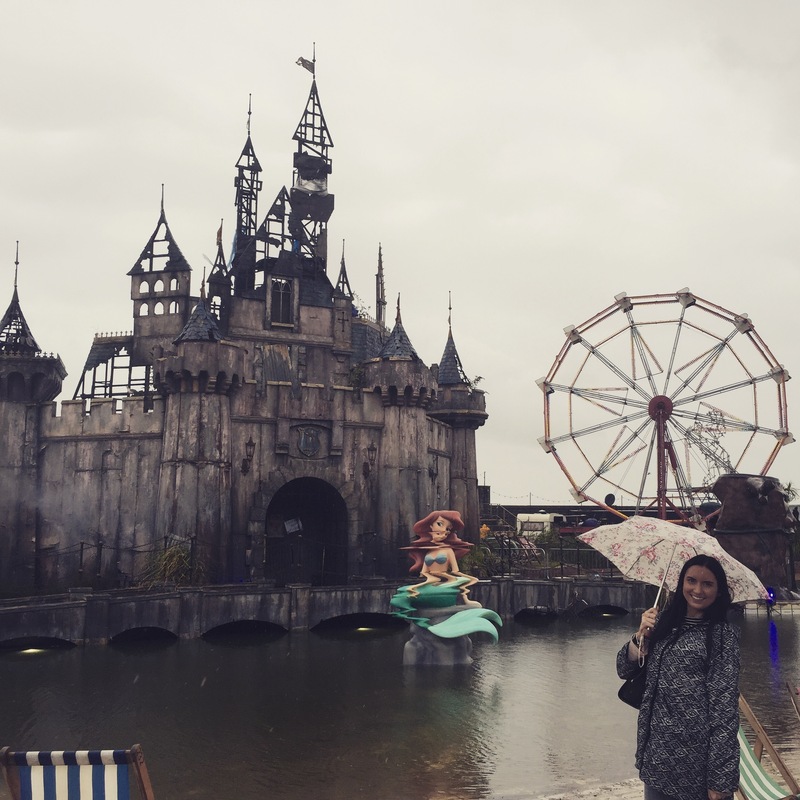 The fairytale is over, the world is sleepwalking towards climate catastrophe, maybe all that escapism will have to wait.” On a grey, wet and miserable day which fitted the mood perfectly, everyone was eager to see this unique display of work from artists across the world, comprising an iconic display of anarchy. One of the unavoidable topics throughout the park was animal advocacy. The first subject which was pretty difficult to avoid was orca captivity. From all the media hype of the past week, I was well aware of this but didn’t realise it would be to such an extent. 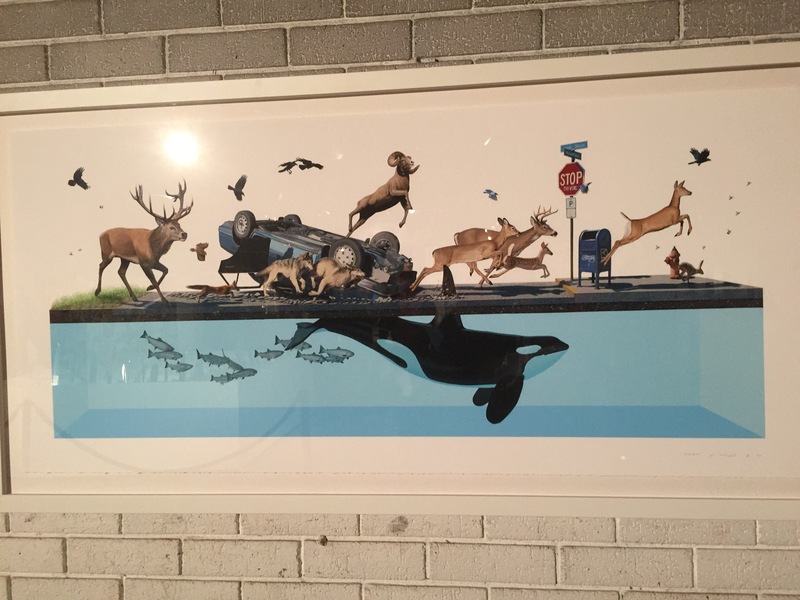 The first gallery includes the interesting work of Josh Keyes, whose distinct paintings resemble diagrams that you’d find in a school textbook. These two images tackle the concept of orca captivity – capturing the giants of the sea below animals living on land. Josh Keye’s orca captivity artwork. Next was the sculpture I had been waiting for. 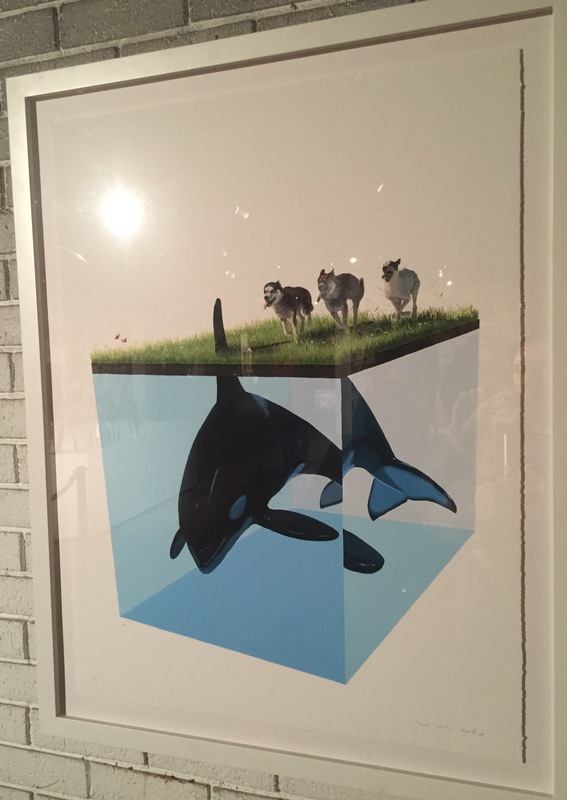 Created by Banksy himself, this is argued to be the best anti-Seaworld art created. It shows an orca jumping from a toilet bowl, through a hoop held by a trainer, with a child’s play-pool awaiting the whale’s landing. 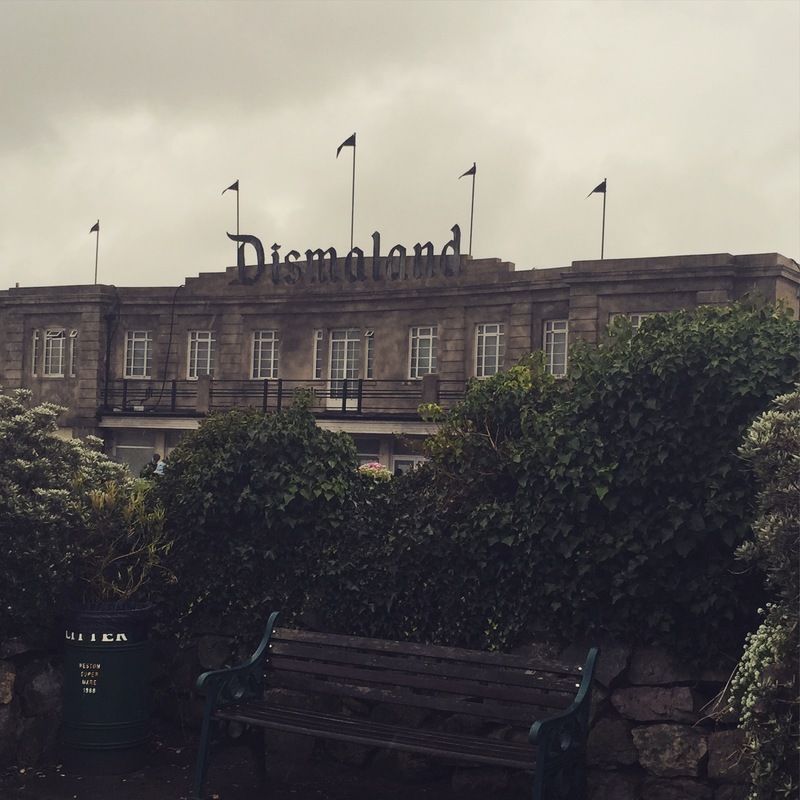 Located at the far end of the park, the sculpture is placed in front of old, decaying steps which seem to resemble those that a cheering audience would be watching from at Seaworld. Due to recent documentaries such as Blackfish, the controversial topic of keeping orca’s in captivity is becoming increasingly discussed. 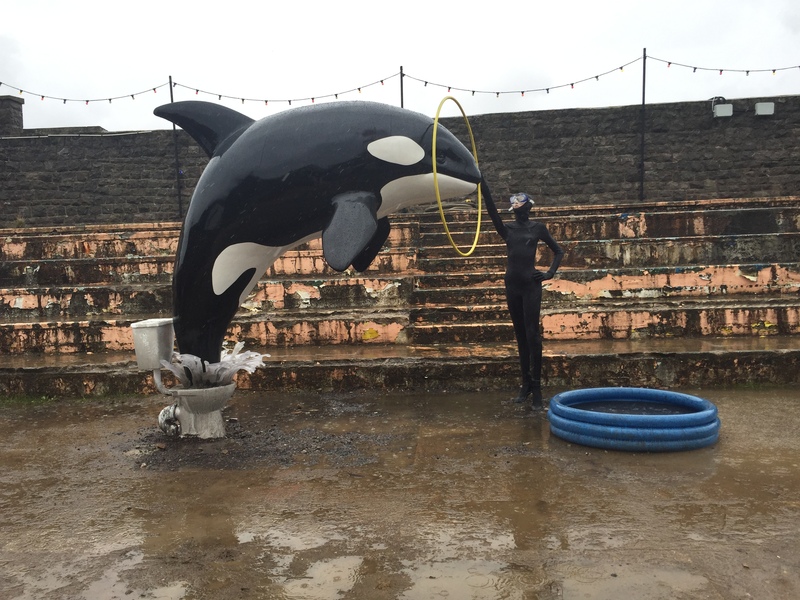 Here, Banksy points out what these intelligent, impressive creatures have been reduced to in marine parks that use them for entertainment purposes. 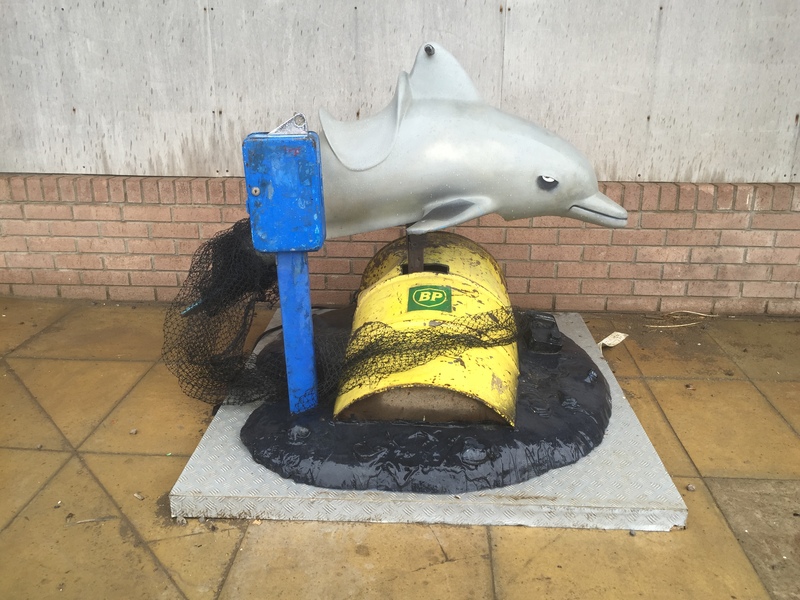 Keeping with the theme of marine animals, the consequences of over-fishing was also acknowledged in a sculpture of a dolphin being caught up in a fishing net. Another predicament the creatures of the ocean are in, due to human actions. One of the consequences of large-scale fishing. 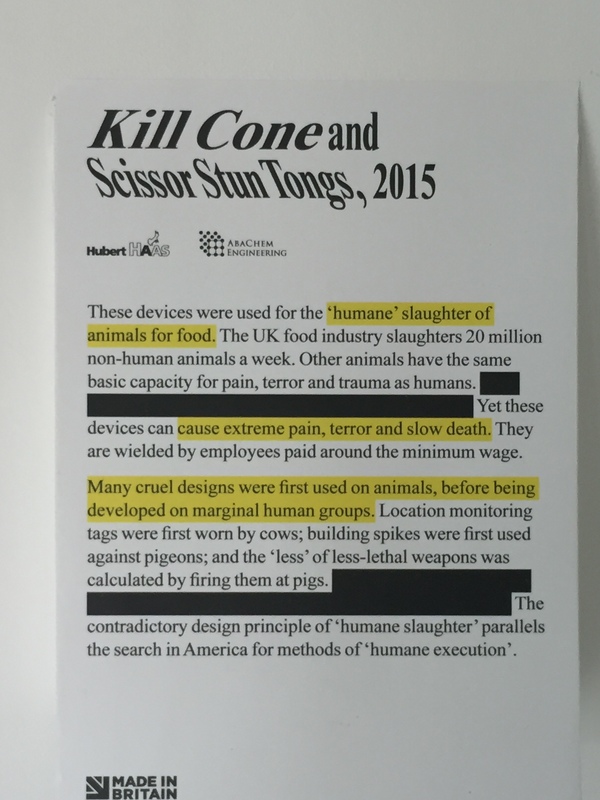 To my surprise, even factory farming was targeted, with the methods used called to question in an exhibition called ‘Cruel Designs’. First was the method of stunning which was ‘advertised’ in an ironic advert similar to those found on tubes in London. 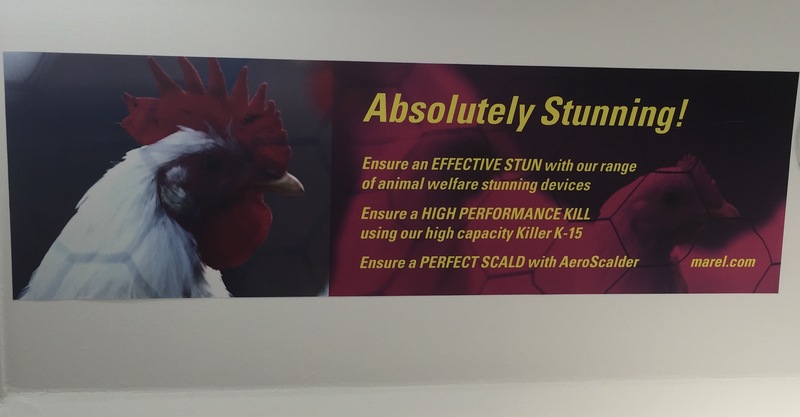 Much like those used to promote household or garden equipment, this advert was promoting stunning devices which would ensure an ‘effective stun’, ‘high performance kill’ and a ‘perfect scald’. There was also recognition of ‘humane’ slaughter, posing the question: can slaughter ever be humane? Here there was footage from a factory farm, paying tribute to the 20 million animals that are slaughtered in the UK food industry each week. The accompanying information identified how these non-human animals are able to feel pain, terror and trauma just the same as humans. This then recognised the contradiction in the term ‘humane slaughter’, just as in the search for methods of ‘humane execution’ upon humans in America. Powerful images that send powerful messages.